It'll be out sometime next year. 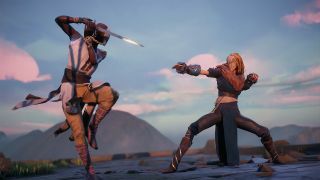 Absolver is an "online multiplayer combat RPG" that, to me, looks like Bushido Blade meets Zeno Clash (and if it's not that, could someone make that, please?) It was announced a few months ago, and it's not got any less enigmatic since, even with the release of a new trailer at the PlayStation Experience yesterday. The Sloclap-developed, and Devolver-published game is still on track for an unspecified 2017 release, and you'll be pleased to hear that it's "coming first to PS4 with exclusive content". Boo-urns! Does that mean it'll be on PS4 before Xbox One, or on PS4 before Xbox One and PC? It's a bit unclear, but hopefully that "exclusive content" is little more than a bunch of inconsequential fluff like Crash Bandicoot and Kratos masks or something.